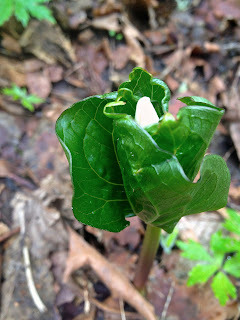 You can always tell it is Springtime in Forest Park because the Trilliums start blooming. 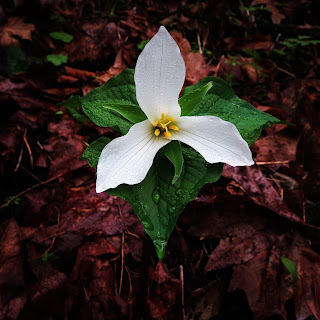 And this weekend on my solo run I spotted quite a few fully bloomed Trilliums. I am so ready for Spring, I normally spend my winters snowboarding (and running), but with my wrist injury I have been very limited on my activities. Just as my wrist started to get better and I am almost graduated from physical therapy, my back starts having issues. I am not quite sure what caused it, but I kept running and not listening to my body, which made it worse. I woke up one morning barely able to stand straight and having major back spasms. 6 days, no running, 3 massage and 2 chiropractic appointments later , my back started to straighten out enough where I thought I was ready for a run. Somehow I was able to hobble through 12 very slow and grueling miles. Not the smartest idea. We had big plans this week to go for a short run on Saturday, then take Monday off work for our longest training run: a plain old 26 miler in Forest Park. Then Ann's back started to hurt. Then it got worse and she could barely walk. She tried all sorts of treatments, which are slowly helping, but we rescheduled our big run a couple weeks out. Instead we went for one shorter run on Sunday. 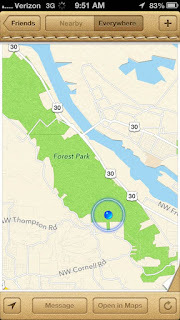 I was determined to stay on the flats, so we drove to the Wildwood trailhead right on NW 53rd. We headed north, and I could tell that Ann was in pain-- she still can't even stand up straight! It wasn't very far in that we walked for a bit, discussing what to do. We turned around and headed back to see if the direction of the trail (since it tilts a bit downhill) would change things up. It helped a bit, so we ran a few miles out past our start, then back; and past the start again, then back. In total, with three out-and-backs, we ran about 12 miles.